Blackhawks fans everywhere will soon be making the grand pilgrimage to D.C. to watch their team battle it out against the Washington Capitals at the 7th annual Winter Classic on New Year’s Day. Since its beginning, the Classic has been held in Chicago, Boston, Buffalo, Philadelphia, and Pittsburgh. Before the Stanley Cup Finals in Chicago almost four years ago, NHL Commissioner Gary Bettman promised the Capitals they would get to host the Winter Classic within two or three years. Finally, after the Winter Classic in 2013 was postponed because of the 2012–13 NHL lockout, they have their chance in 2015. Nationals Park will be transformed into an outdoor venue, and over 41,000 die-hard hockey fans will brave the cold to see two of the NHL’s star forwards, Alex Ovechkin and Jonathan Toews, go head to head. Are you attending the game? 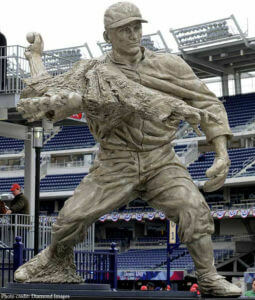 Nationals Park is a venue special to us here at the Studio of Rotblatt – Amrany, being the site of three of our sculptures commissioned by the Washington Nationals of legendary players Frank Howard, Josh Gibson, and Walter Johnson. All three statues are made of white bronze and granite, each standing at about 8 feet tall. Every player is depicted doing what they were known for best: Howard hitting, with the intimidating power of his swing appearing with a repetition of baseball bats through a seconds time; Gibsons follow through swing after one of the farthest home-run hits in history; and Johnson pitching, his skill shown by a stylized interpretation of the fourth dimension. If you’re there for the game, take a photo with the statues and post it on our our Facebook! We’d love to see who’s representing the Windy City in DC! But if you can’t make it out to the Classic, no worries. Set up a viewing party at home, or take a visit to our sculptures of famed Blackhawks Bobby Hull and Stan Mikita outside of the United Center. The legendary Blackhawks players are sure to get you in the spirit of the game! We hope you all are having a safe and happy holiday, and be sure stay warm!